As more and more of us long to preserve our youthful looks for as long as possible, cutting-edge anti-aging technology has become increasingly popular. Microcurrent machines are a hot new must-have in the world of beauty and esthetics. As you age, the skin loses firmness and elasticity as a result of depleted collagen and elastin stores. The outcome is sagging, loose skin and the appearance of fine lines and wrinkles. With many people expressing an interest in line-free, youthful skin, microcurrent machines have become incredibly sought-after. Used to tighten the skin and smooth wrinkles by stimulating the facial muscles, these innovative gadgets offer a non-invasive alternative to more drastic surgical anti-aging techniques. As technology advances, the range of microcurrent machines on the market increases. For consumers, it’s always positive to have a choice, but how do you go about finding the best microcurrent machine? A quick search will give you access to a vast range of products, but you don’t have to devote hours to trawling through specifications, as we’ve done the legwork for you. If you’re thinking of investing in a face lifting machine, it’s natural to want the best results. Here are some of the leading contenders on the market at the moment. If you dream of smooth, wrinkle-free skin, and you don’t want to spend a fortune, the Biosincron Beauty Spa EP-2000 Face Lift Device could be an ideal option for you. A versatile, adjustable gadget priced very reasonaly, which aims to tackle sagging skin and roll back the years, this is a highly-rated product with a proven track record. This Biosincron device uses powerful, painless, pinpoint-precision stimulation techniques to target the muscle layers beneath the dermis, softening the appearance of lines and wrinkles, and increasing firmness and bounce. The process is incredibly simple and relaxing. All you have to do is apply a thin layer of gel to the face and neck and then let the facelift device do the work. You can target specific areas of the face and decolletage and you should notice a difference, even on deep wrinkles. As well as producing impressive results, the Biosincron facelift device is also visually appealing and durable. It is gold plated, and it is also rust-proof. Boasting battery life of 100-hours, you don’t need to worry about charging or trying to navigate your way around the face with cords and wires. In summary, if you’re looking for an effective, affordable microcurrent machine that has a lot to offer without possessing all the mod cons, this could be an excellent investment for you. FINALLY, THIS 15 YEAR PROVEN microcurrent face lift machine makes its way from Europe & South America, naturally, gently and effectively supporting YOUTHFUL, SUPPLE, TIGHTENED eye bags, chin, crow's feet, smile lines, waddle and neck. HOW IT WORKS: 2 UNIQUELY positioned electrodes create a full cycle gentle current between tip, face, neck, arms and metal handle for DEEPER PENETRATING WAVES that promote FASTER RESULTS. NO PAIN - ALL GAIN FACE MACHINE - (ZERO SIDE EFFECTS) ADJUSTABLE micro-current face machine supports FASTER results than any other face mask machine or light therapy device, just like an instantface lift - WON'T STING, shock or pinch like other face machines. 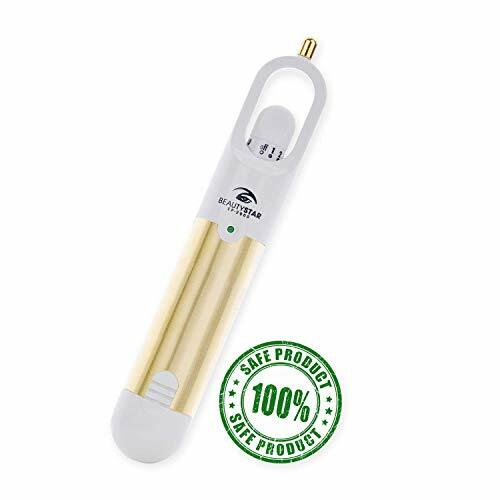 GENUINE GOLD PLATED = SUPERIOR RESULTS - ENHANCED CONDUCTIVITY, RUST PROOF, STERILE gold-plated metallic face treatment machine parts deliver smoother, WIDER electrical current across skins surface, yielding FAR FASTER results in LESS TIME. INCLUDES EVERTHING YOU NEED - NO CORD REQUIRED: Don't waste days charging and recharging your toning tools. Beauty Star face sculping machine includes a 100 HOUR 9V battery, plus smooth, non-sticky conductivity gel, so you start reviving your beauty the second the box arrives. If you’re on the hunt for a high-tech gadget that delivers results from the first use, the Lemique Korean Face Massager offers a wealth of benefits. Designed to protect and rejuvenate the skin by combining precision techniques, this anti-aging tool is one of the best microcurrent machines for estheticians, and it may also appeal to those looking to invest in an advanced product for home use. 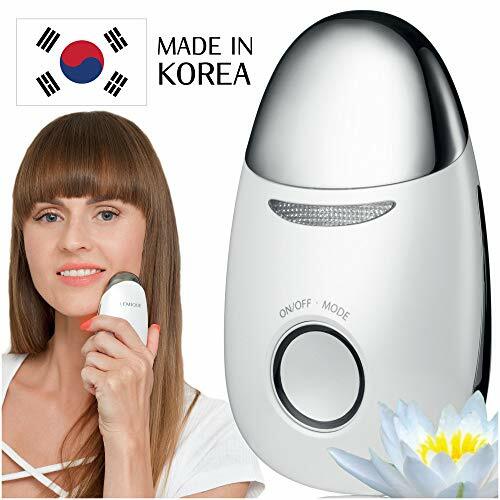 Lemique’s Korean Face Massager promises to promote faster skin cell renewal and regeneration, reduce the visibility of lines and wrinkles and improve skin tone, and it can also help to improve the absorption of skincare products, including serums. To achieve noticeable results, the device uses a blend of different technologies and therapies, including LED red light, heating, galvanic, microcurrent and microvibration therapy. This powerful combination increases ATP (adenosine triphosphate), improves circulation, protects against UV rays and boosts natural collagen and elastin production. If you’re looking for an advanced anti-aging device, which is proven to improve skin tone, as well as eliminate lines and wrinkles, the Lemique Korean Face Massager could be an excellent choice for you. It may be a bit pricey for some consumers, but if you’re an esthetician or you don’t mind paying more for additional features, the price tag shouldn’t be too much of a turn-off. Designed to promote skin cell renewal and natural peeling to revive the complexion, the New Spa High Frequency D’arsonval Facial Device is a popular option for those who suffer from common skin complaints including oily skin. Boasting a range of electrode options, buyers can alter intensity levels to cater for different skin types and benefit from skin-healing and drying properties. This device can help to soften lines and reduce the visibility of signs of aging, but it can also facilitate desquamation (peeling), reduce sebum and oiliness and cleanse and freshen the skin. In addition to offering skin cleansing and anti-aging benefits, this New Spa device can also improve skin color and tone. The 7 electrodes are designed to provide both direct and indirect high-frequency stimulation, and you can adjust the electrode based on the areas of the face or neck you wish to target and your individual skin type. Who should buy the New Spa Frequency D’arsonval Facial Device? This device is suited to buyers who are looking for a microcurrent machine that offers skincare benefits and targets skin-related problems. At $139, it is more affordable than some other products on the market, but review scores are not as high, and there is less impetus on anti-aging. If you have dry or sensitive skin, or you’re focused on finding a machine that prioritizes tackling lines and sagging skin, this might not be the ideal match for you. 7 ARGON ELECTRODES + 3 NEON ELECTRODES. Increase in circulation. Produces heat in the tissues, bringing nutrients to the area and removing waste. Aids desquamation. Refines the skin. Produces an erythema. Improves skin color. Dries the skin. Helps to heal pustules. Cleansing - due to the increase on sebum flow and perspiration. Germicidal - due to ozone formation which kills bacteria. Suitable for all skin types, the DermaWand PRO is an advanced anti-aging device, which tightens the skin and irons out lines and wrinkles without the need for surgery. Up to 50% more powerful than the standard model, the DermaWand PRO is an effective solution for those hoping to look and feel younger. 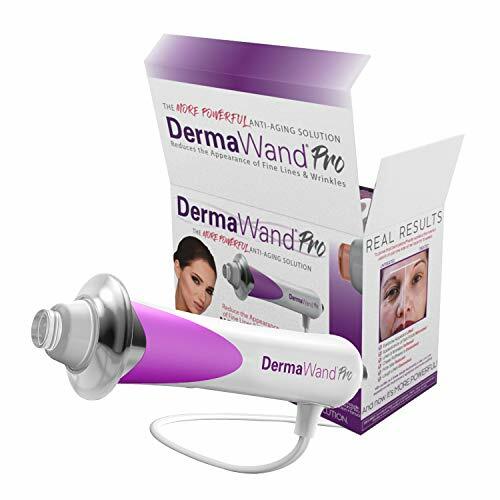 The DermaWand PRO is a sophisticated, innovative device, which has been designed for simple, seamless home use. Boasting 12 treatment levels (the standard model has 9), this device is up to 50% stronger than the original version. With the DermaWand Pro, you can reduce puffiness and bags under the eyes, soften lines and wrinkles, lift the brows and reduce the size of the pores in the comfort of your own home. This impressive device produces results by generating thermal energy to provide instant stimulation and increase oxygenation. Delivering 100,000 micro-pulses per second, you’ll feel like your face has had an intensive, but relaxing massage. The sleek, lightweight design and no-slip grip make the device easy to use, and there’s also a handy carry case. The DermaWand Pro is a more advanced version of the DermaWand, which offers additional treatment levels and more powerful anti-aging techniques. If you’re looking for a device to soften wrinkles, tighten the skin and help you roll back the years at home, and you don’t mind spending around $200, you can’t go wrong with this product. Wrinkles and fine lines are often the first signs of aging we spot when we look in the mirror. While aging is inevitable, it is possible to turn back the hands of the clock and create a smoother, more youthful complexion. The ShowYoung Microcurrent Mini Facial Massager is designed to wind back the hands of the clock by increasing natural collagen production and stimulating the facial muscles. Marketed as a safe, affordable anti-aging device, this ShowYoung facial massager uses microcurrents to stimulate the facial muscles, promote skin cell rejuvenation, improve skin tone and increase collagen production. The process is very simple and involves cleansing the face, applying a gel or lotion and holding the device against the skin, moving it in gentle motions to cover problem areas. This machine is suitable for the face and body and it is designed for daily use for around 10-15 minutes. This product comes with a charging cable and a carry bag. If you’re looking for affordable microcurrent facial machines, and you want to target lines and wrinkles, soften folds, and improve skin texture and firmness, the ShowYoung Facial Massager is a great buy. FACIAL TREATMENT PRINCIPLE - Use microcurrent safe and effective facial stimulation to rejuvenate skin [Maximum Microamps - 350]. WRINKLE KILLER - Produces collagen to REDUCE WRINKLES AND FINE LINES. Improve skin texture & strengthens skin's absorption, save dull skin. ALWAYS READY TO USE - light and convenient. Various trends for outdoors, office, home, travel. Gift for girlfriend, mom, client, commemoration day. QUALITY - 5 level strength,Pink, Titanium alloy connector, ABS plastic. PACKAGE INCLUDES - Product, Instruction Manual Built-in Warranty Card & Charging Cable If you have any questions, please consult customer service and ask you to answer all questions. Microcurrent machines produce anti-aging benefits without the need to undergo invasive treatment. If you’re looking for a face lifting machine, hopefully these product reviews will help you find the ideal device for you.